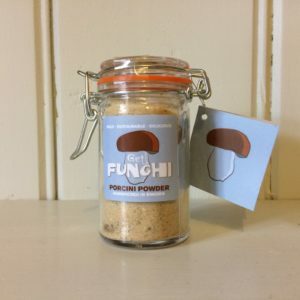 What can you use Get Funghi porcini powder in? Well the quick answer is, just about everything! 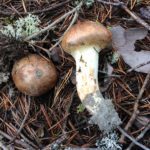 We add a teaspoon or so to a bechamel to make an instant mushroom sauce, to soups, casseroles and stews of all kinds to add an umami kick, to home made pastry for a mushroom pie, or to home made pasta….the list is almost endless. We’ve even tried it in a biscuit recipe from a Swedish friend. It was fun getting people to guess what the secret ingredient was! 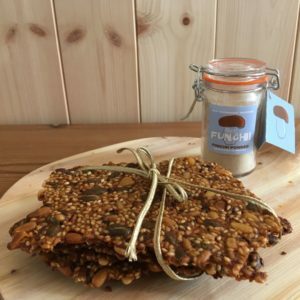 But our favourite so far has to be this Swedish seed crispbread, which also happens to be gluten free. It’s really easy to make but keep an eye on it if your oven is getting a little unreliable heat wise like mine is. Set oven to 140/150°C depending on your oven. Cover a baking tray (approx 30 x 40cm) with grease proof paper. Mix all the dry ingredients together, stir in the oil and then the boiling water. Let it stand and thicken for 15 minutes. Place in the middle of the greaseproof paper on the baking tray, cover with another piece and roll out thinly until it more or less fills the tray. Remove the top piece of greaseproof and bake for 30 – 50 minutes, depending on your oven. Slide the crispbread on the greaseproof onto a rack and leave to cool. Break into pieces & keep in an airtight container if it doesn’t all get eaten straight away! 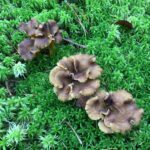 We’ve got two tastings coming up before Christmas, presenting with you two perfect opportunities to fill your store cupboard or get some of our dried wild mushrooms as presents for the foodie in your life! 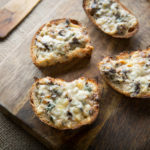 On Tuesday 11 December we’ll be handing out freshly made wild mushroom toasties at our old friends Eighth Day Coop on Oxford Rd in Manchester from 11-2, and the following Friday will see us at new friends Chinley Cheese, in Chinley, Derbyshire, also from 11-2. While we’re on the subject of stockists, we’re also now selling at the fabulous Pear Tree Cafe in Whaley Bridge, Derbyshire, who are also, we’re happy to say, occasionally using our mushrooms in the kitchen. We can highly recommend their absolutely delicious mushroom soup! The full list of stockists can be found on the stockist page on this website (where else!). If you don’t happen to live near one, email us to let us know which varieties and how many packets you want and we can put an order in the post to you. 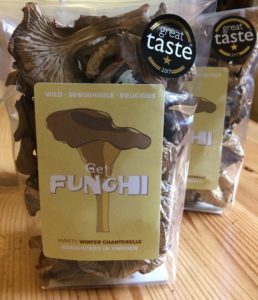 We’re delighted to have been awarded one star from the Guild of Fine Food in the Great Taste Awards for our dried wild Winter Chanterelle. 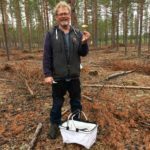 It’s a lovely confirmation of the quality of our products, which as you all know are entirely hand picked by us in Bengt’s homeland of West Sweden. 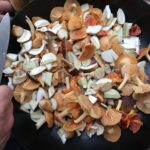 We dry them on the same day we pick them so we lock in the maximum flavour, and because we pick carefully and clean stems in the forest you won’t find any grit in our packets, so you don’t need to sieve the soaking water, just use it as it is in the dish you are cooking. Coming soon will be an online sales page so if you don’t live near any of our stockists you’ll be able to buy direct. 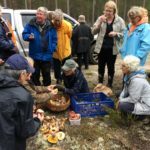 We’ve had a lovely busy autumn taking people out on forays in Derbyshire and then heading back to West Sweden for the big Winter Chanterelle pick. Coming up on Saturday 4 November is a tasting at the wonderful Epicerie Ludo in Chorlton. 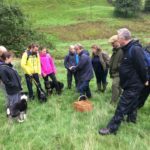 We have so much fun going out with groups, who are always a cheery bunch whatever the Derbyshire weather decides to throw at us. 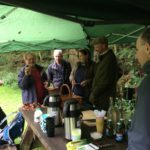 After a gentle wander around the fields and woods we gather around the picnic tables to go over what we’ve found – and what we’ve brought with us in case we don’t find anything – then enjoy a fry up of wild mushrooms and sausages. The home made cake afterwards always goes down a storm as well! 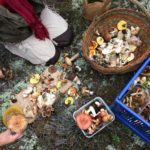 We get emails for weeks afterwards with photos of finds our guests want to check with us, and it’s great to know that we’ve both enthused them and given them the confidence to start picking beginner’s mushrooms (ie ones that can’t be mistaken for any other non-edible mushroom) by themselves. 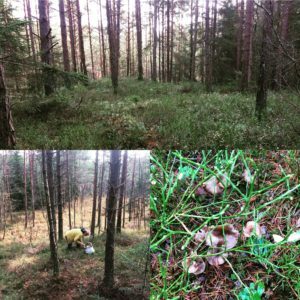 Picking in West Sweden – and simply being home – is always lovely. There’s a mellow peace and quietness in the woods at this time of year, and warm muted colours that help stress levels ebb away. We head out after breakfast to one of our tried and trusted spots, pick for a couple of hours, sometimes companionably in the same place, or away from each other, letting the thoughts meander as we search and pick, then head back for our picnic. Most days we’ll set out again after lunch for another couple of hours before the light goes. When we get home the mushrooms go on the drying racks and are ready the day after to be packed into airtight bags. 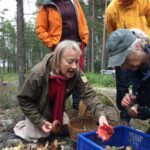 It’s an autumn activity – and way of life – we highly recommend! 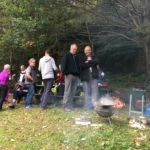 We’re delighted to be co-hosting a foray on Sunday 1 October with Mount Cook Adventure Centre in south Derbyshire. 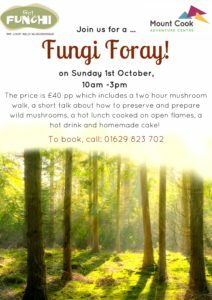 This event will follow the same format as our very popular Hayfield forays, with a roughly two hour walk through nearby fields and woods followed by lunch al fresco of grilled sausages & bread to eat with a fry up of some of the mushrooms we’ve picked, accompanied by hot and cold drinks and home made cake. Book your places with the centre, full details are on the poster below or on their website which you can find via the link above. 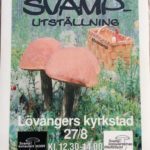 Summer in Sweden – boat life, mushrooming and Mushroom Consultants! 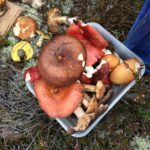 Oh it’s so lovely to be back in beautiful West Sweden for our summer hols/mushroom picking trip. When we’re not in the forests we love to spend time by the coast, and this area is a paradise for anyone who loves the outdoors, whether wet or dry. 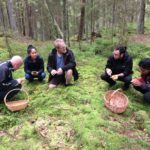 It was great to get a mushroom walk in with family over from the UK, and explore the archipelago. 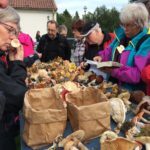 A highlight this year has been our trip up to Lövånger in Västerbotten on Sweden’s north east coast, to go to the Mushroom Consultant’s AGM (Svampkonsulenternas Riksträff), organised by the local branch Svampkonsulent Norr. It took us two days to drive up and was a round trip of 2,360 km. 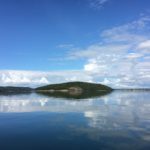 Sweden is such an incredibly long, narrow country! 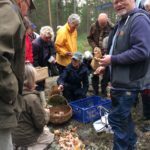 It was great to meet up with such a lovely bunch of mushroom experts, and, amongst other activities, we attended a lecture on poisonous mushrooms, went on a foray with local mushroom consultant Anna-Lena Lindqvist, and helped set up a wild mushroom display that members of the public could also come to. 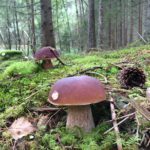 A speciality of northern Sweden is the matsutake mushroom, tricholoma matsutake, which until very recently was not picked at all by Swedes. 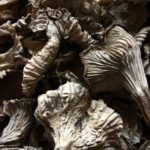 Discovered to be growing in the region by the Japanese, who prize it very highly, it is now picked mostly to be shipped over there. Many Swedes still find the strong, almost perfumey taste too much. We were delighted to find our very own specimens which we are looking forward to trying in a recipe. 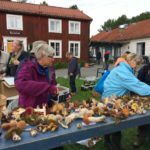 On the final day we were part of a group interviewed by SVT, Sweden’s national television broadcaster, for an item on the local evening news about mushroom consultants, whose mandate is to encourage the public to go foraging safely, and get some exercise in the process, as well as helping to identify wild mushrooms. 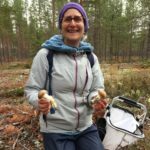 What a great resource they are for the Swedish nation! 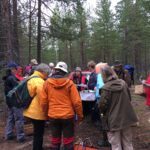 We so love what we do. 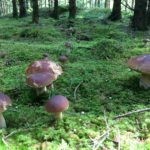 The feeling never diminishes, and every season we feel the same, that it’s a delight and privilege to spend time in forests and fields picking wild mushrooms. It really is a reward in itself. We’re proud of the products we sell, which have genuinely been picked and prepared with love and respect. So it’s an absolute delight and honour to be chosen as one of the small producers nominated by Women and Home for a Great Taste Awards Golden Fork. Especially when you look at the list, containing so many other committed and enthusiastic producers who are also clearly genuine food lovers like us. It’s a public vote, so we hope you’ll try as many of the products as you can get your hands on to help you make your choice. 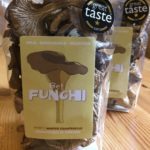 There’s a full list of our stockists around the country on this website if you haven’t already tried Get Funghi mushrooms. The list of producers, and a link to vote for your chosen one, can be found via the link below. We wish all the others the best of luck! Some delis are tiny but fully formed. This is certainly the case with our stockist No 74 Delicatessen in Bollington, Cheshire. They’ve got a great selection of deli and other products sourced as locally as possible, and a really popular cafe serving delicious home made lunch dishes and cakes. We’re looking forward to our first tasting there on Saturday 17 June. 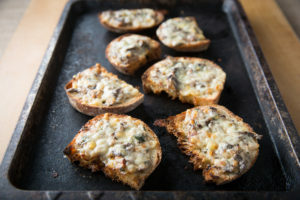 We’ll be giving out freshly made wild mushroom toasties for you to try from 11-2 , and as always we’ll have a selection of lovely recipe cards for you to pick up.